Amazon organizes Amazon Quiz daily from 8AM – 12PM and offers huge prizes everyday. By just answering 5 simple question, you can stand a chance to win that prize. In today’s Amazon Quiz, you can win a Saregama Carvaan which costs Rs 7390 on Amazon. So, don’t miss out on this free chance. 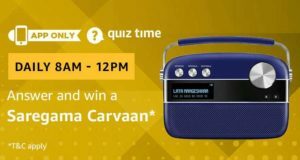 How to Answer and win a Saregama Carvaan? 2. Open the App >> Login/Sign up with Amazon. 3. On the dashboard, you’ll see a banner related to Quiz. 4. Click on the banner >> Start the Quiz. 5. Answer all the questions correctly (Answers given below) and you’ll get a congratulation message stating that you are in the luck draw now. 6. If you win the prize, you’ll be informed via Email. List of winners will also be published on the Amazon. Q1. The cherubic baby, Cupid, is popularly associated with Valentine’s Day. What does he carry with him? Q2. In the phrase XOXO, what does the ‘O’ stand for? Q3. Which Pakistani cricketer made his test debut in the same match as Sachin Tendulkar? Q4. The longest wrestling match in Olympic history was played in the 1912 Summer Olympics. How long did it last? Q5. Who is the Greek goddess of love? The declared winner(s) will be eligible for winning the Prize. Results on 28th February 2019.